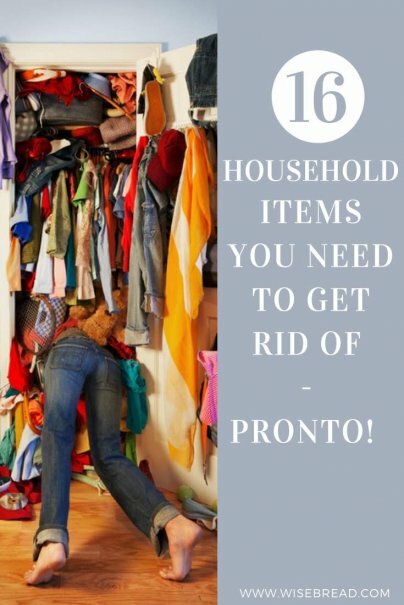 Home » Frugal Living » Home » You Need to Get Rid of These 16 Household Items — Pronto! It happened again this past weekend. The cleaning bug sunk its teeth into me. I found myself emptying drawers, cabinets, and closets, and hauling bags of stuff to Goodwill. The rest I dumped in the trash. Unfortunately, once I'd gotten rid of the usual suspects — clothes we don't wear anymore, books we haven't read in years, several metric tons of outdated magazines — I was left with the difficult-to-dispose-of items. These are the things that I want to get rid of, but I don't know how. Once I get to these items, I generally end up tossing them back into their drawers to deal with "later." Of course, they tend to stay put for years because I never have figured out how to dispose of them responsibly. Until now. I've done extensive research and come up with the definitive list of things that belong in a recycling bin rather than in your home, and how you can get rid of them properly. My first set of kitchen knives were the cheapest knives Walmart had to offer, and they certainly were not great quality. However, I kept them for years, even after I'd invested in a decent set because I had no idea how I could safely dispose of them without potentially harming any of the people who handled my trash. I now know that you can wrap a knife's blade in butcher paper, then bubble wrap, and then tape it up in an appropriately sized cardboard box. Once it is safely packed in this way, you can throw it away — or more easily give it away to the Salvation Army or a soup kitchen without hurting anyone who might be sorting your donation. Not sure what to do with the mixer whose beaters are missing, or the waffle iron with a frayed cord? Small kitchen appliances that are not in good enough condition to be donated need to be recycled, but it can be tough to know how to find a recycling center that will accept them. If your appliances were manufactured by Hamilton Beach, the company will accept old and nonfunctioning products for recycling, although you are on the hook for shipping costs. For all other brands, you will need to find a local recycling center. The website earth911.com allows you to search for local centers that accept the appliances (or other items) you need to dispose of. Holey sheets and bleach-stained towels may not seem of value to anyone. But local animal shelters often have a need for bedding, and the dogs and cats certainly won't care that Darth Vader has faded to invisibility on your old pillowcases. Alternatively, you can often give them to Goodwill, the Salvation Army, or other local charities. They work with partners to recycle used textiles into rags, fiber for furniture or insulation, or clothing that gets repaired and resold in less developed countries. For some reason, hangers seem to multiply in closets when you're not looking. Plastic hangers tend to be harder to dispose of — they are often not accepted for plastic recycling, and most Goodwill stores will not accept them. However, other thrift or secondhand clothing stores are often happily to take your plastic hangers off your hands, or you can post them on Freecycle. Wire hangers can be returned to the dry cleaner. Even if you wear your bras until long after they have stopped supporting you, old lingerie has a tendency to take up space in your underwear drawer, since it can be tough to know how to get rid of it. The Bra Recyclers is a textile recycling company that will recycle your old brassieres and keep those over-the-shoulder boulder holders out of the landfill. Sign up with the site, and receive a label to mail in your expired bras. I run between 200 and 400 miles per year, which means I need a new pair of running shoes about once a year. Unfortunately, that also means I have many pairs of running shoes still cluttering up my closet, because I don't want to just throw the old shoes away. Thankfully, Nike has a shoe recycling program called Reuse-a-Shoe, which will accept worn-out athletic shoes from any brand and recycle the components. You can drop off old athletic shoes at most Nike or Converse stores. Knowing what to do with the last three unneeded pain pills from having your wisdom teeth removed, or the bottle of medication your mother-in-law accidentally left behind on her last visit can be nerve-wracking. You can't flush or trash these items, because you don't want to risk getting the medication into the local water system. In the past, you might have to wait for the annual National Prescription Drug Take-Back Day (generally in late April) to be able to safely get rid of expired medication. But there are now independent community pharmacies around the country that are authorized to take back medication year-round. You can find one near you at DisposeMyMeds.org. Eye makeup should be replaced every few months to protect you from infection, and other facial cosmetics should not be used for more than 12 months. But simply throwing away old products can be potentially harmful to the environment, because they contain harsh chemicals. Some cosmetics manufacturers — most notably MAC — will accept their own empty cosmetics packaging for recycling, and you can find a list of mail-in programs for recycling packaging from other brands of cosmetics at the site ecolife.com. To dispose of the product itself, ecolife recommends scooping it all out of the container, then putting it in a sealed jar or other packaging that you can then send to the landfill. If you no longer use your hair dryer or curling iron because it's not in usable condition, check out earth911.com to find a small appliance recycling center near you. The last dregs of wax seem impossible to get out of jar candles, which means you might think you're stuck either throwing the glass jar away or holding onto it and its last bit of wax forever. But apparently you can freeze the jar, making it easy to pull out the remaining wax, and then recycle the clean jar. There are pieces of crayons all over my house. They show up in couch cushions, in bathroom drawers, in my purse, and even in the kids' beds, on occasion. Rather than throw out the random crayon stubs (as I'm tempted to do whenever I find one), I can now start sending them to Crazy Crayons, a national recycling program that accepts used crayons to keep them from going into the landfill. You used to have to hold onto the owner's manuals for all of your appliances, gadgets, and gizmos, just in case you ever needed to troubleshoot a problem. But the internet now has all of the information you need, so go ahead and throw these in the paper recycling. Compact fluorescent light bulbs can be recycled at The Home Depot. The mercury-containing bulbs should not be thrown away. LED bulbs are safe to throw away, but you can find a local recycler at earth911.com or recyclenation.com. Every home has a tangle of wires that does not seem to belong to any particular device. Drop those bad boys off at Best Buy for recycling. You might have saved your old Razr or Blackberry as a potential backup in case you lose your current phone, but that was three or four current phones ago. If your early-2000s era cellphone is now a very shiny brick, take it to Best Buy for recycling. If your cellphone is still functioning, however, you may want to donate it to Cell Phones for Soldiers, which gives service members the ability to call home.